There are usually so many places in each language that just don’t make that much sense but so easy for an inexperienced programmer to adopt and take for granted. 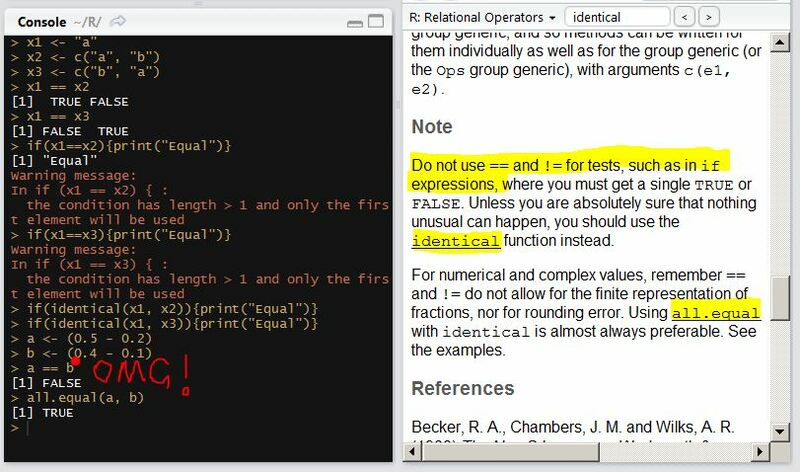 “==” in R is such a thing. I came from a Python programming background and I take for granted that to use “==” in an if statement whenever comparing two objects based on value. However, in R, I just noticed that even in the documentation of “==”, they clearly write down a misunderstanding of “==” will lead to a disaster. “a unexperienced” don’t you mean “an inexperienced” and “in a if statement” don’t you mean “in an if statement” ?